First, the good news: child mortality has fallen in every single country over the past few decades. In fact, a new study found that, globally, 4 million fewer children died before their fifth birthday in 2015 than in 2000. The world has made enormous strides in reducing child deaths, cutting the under-five mortality rate by more than half (53%) between 1990 and 2015. But there’s still much more to be done, and this achievement fell short of the Millennium Development Goal target of cutting the under-five mortality rate by two-thirds. The study, published in The Lancet medical journal, said progress since 2000 has been mainly thanks to reductions in deaths from pneumonia, diarrhoea, malaria, measles and deaths during birth. However, this progress, while remarkable, hasn’t been equal. The study said the 2015 figures highlight the inequality in child deaths around the world: under-five mortality rates in countries range from 1.9 to 155.1 deaths per 1,000 births. Estimates suggest that 5.9 million children under five died last year, including 2.7 million newborns. More than 60% of these deaths happened in just 10 countries in Africa and Asia: India, Nigeria, Pakistan, the Democratic Republic of Congo, Ethiopia, China, Angola, Indonesia, Bangladesh and Tanzania. While these countries, most of which have large populations, have the highest numbers of child deaths in the world, they are not necessarily the worst afflicted. Countries with the highest child death rates lose more than 100 children under five per 1,000 births. They include Angola, Central African Republic, Chad, Mali, Nigeria, Sierra Leone and Somalia. 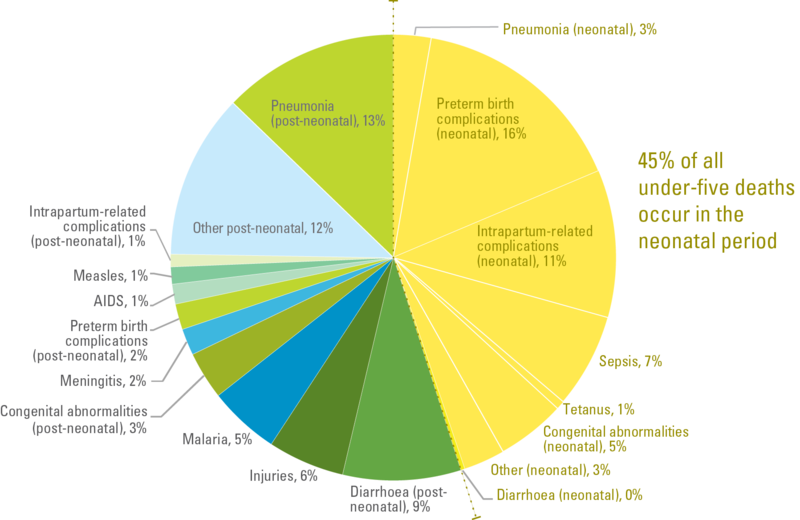 Globally in 2015, the leading causes of death for children under five years old were complications due to premature birth, pneumonia and death during birth. The study said progress on reducing newborn deaths has been slower than for one month to five year olds, which made the Millennium Development Goal target harder to reach. Almost half – 2.7 million – of the 5.9 million children under five lost last year died in their first 28 days. “Child survival has improved substantially since the Millennium Development Goals were set, even though the target to reduce child deaths by two-thirds was not achieved,” said the lead author, Dr Li Liu, of the Johns Hopkins Bloomberg School of Public Health. To improve children’s survival in the worst affected regions, the study recommended breastfeeding, vaccines for pneumonia, malaria and diarrhoea, and improving water and sanitation.